Here’s the deal with this post. The pictures are not that great. And I’m just linking to recipes. HOWEVER. 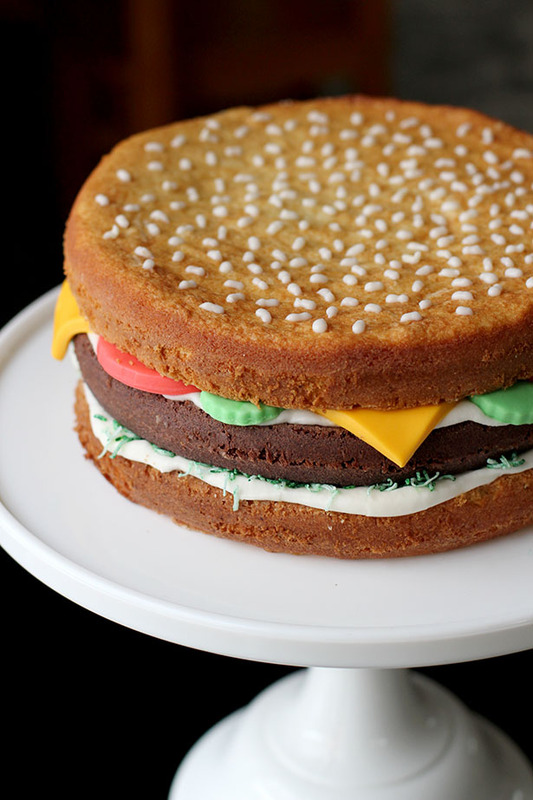 I must write this post because I must share this cake with you. It is too delicious not to share. 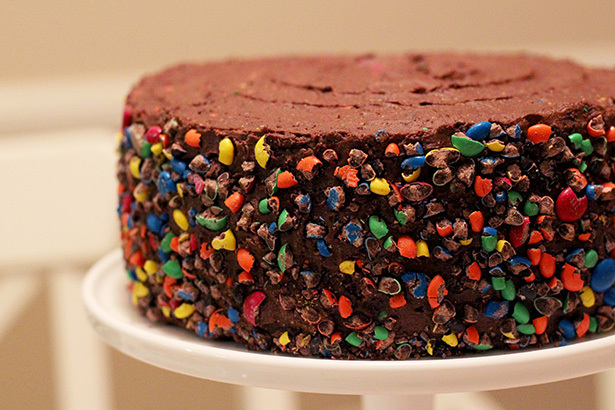 Let me introduce you to the most divine Chocolate M&M Cake you will ever eat. I used the cake part of the SoNo Chocolate Ganache Cake recipe. I frosted the cake with my M&M frosting recipe. I broke up a bunch of M&Ms in a zip-top bag with a hammer and then stuck those broken M&Ms on the sides of the frosted cake. Angels descended from heaven and sang Hallelujah. Reason #2 I am excited about today’s post: I have a spectacular new kitchen tip for you. Why we were never given that tip before I’ll never know, but I’ll tell you what. BEST. TIP. EVER. Nate mentioned their comment as we were about to cut the cake and were both like, “Two knives? Huh?” And then we tried it and WOW. It’s just so easy to slide that first slice right out of the cake when you have two hot knives simultaneously pulling it out. Amazing. Just one more reason to love Extraordinary Desserts, as if I needed another! I will never be scared to cut into a cake again! 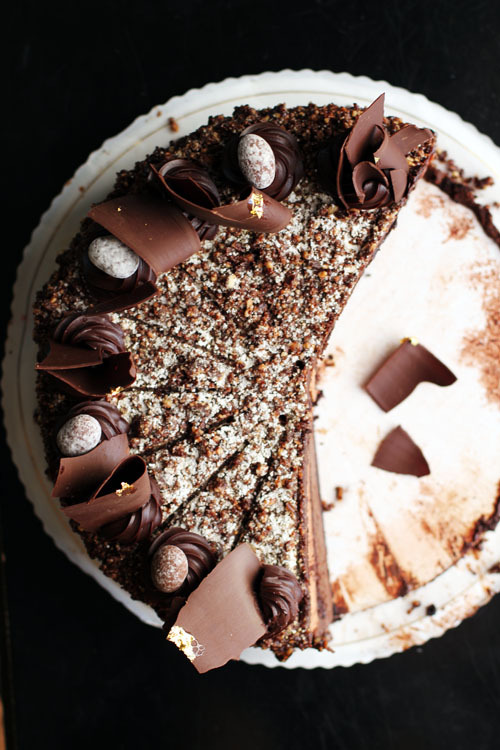 Side note: You can make this cake, the recipe is included in the book Extraordinary Cakes by Karen Krasne, the pastry chef behind Extraordinary Desserts. The cake involves six recipes…you’ve been warned! 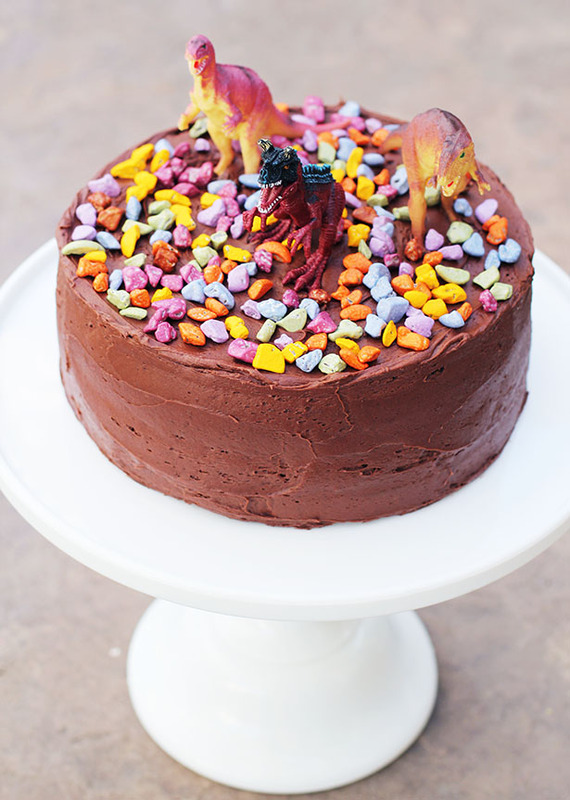 If you’ve been reading my blog for a while, you know that I love making cakes for my kids’ birthdays. The birthday cakes my mom made for me as a child are cherished memories, so it’s something I want to pass on to my own children. 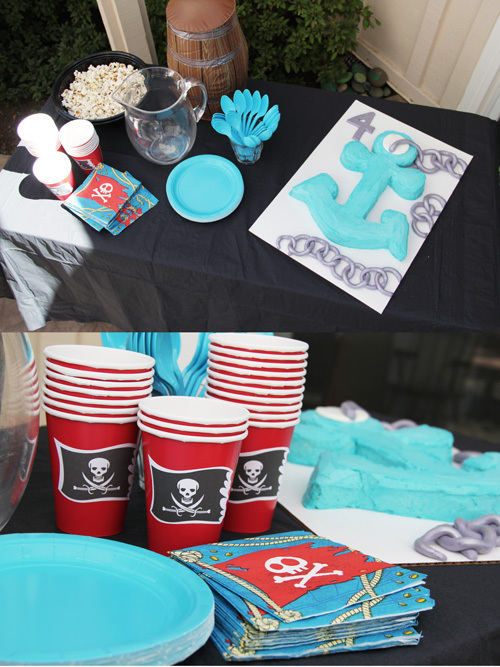 Owen’s 1st birthday party was on Saturday. I made a doggie cake for him because, as a 1-year-old, there are only two things in the world he loves: things with wheels and doggies. 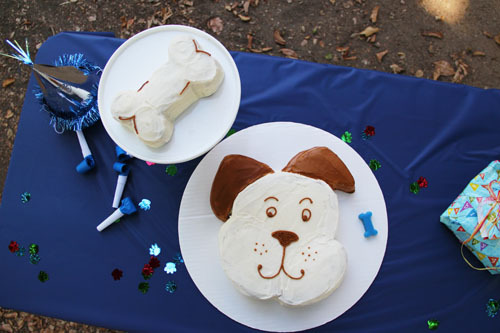 I spent several hours getting the cakes ready for the party and when I was finally able to show Owen the final product, he got super excited and giggled, just like when he sees a real dog! That excitement made all the hard work totally worth it. 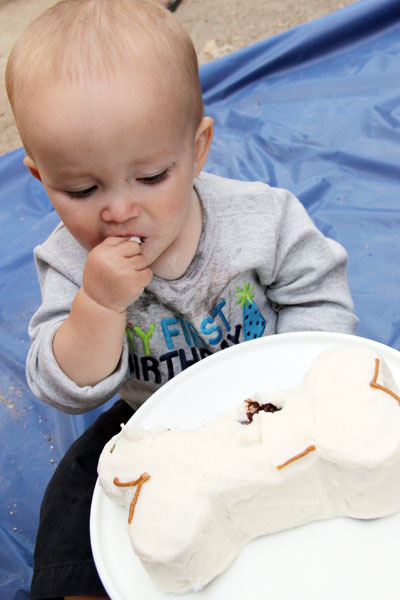 The cake ended up being a huge hit at the party, and not just because it was cute (which it was!). It was uber delicious, too, so I will share the recipes at the end of this post! 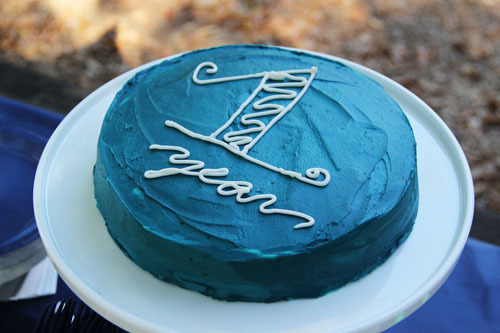 After all these years of figuring out how to decorate cakes on my own, I wanted to share my learnings with you. Remember, I’m an amateur…but I think most of us are, so hopefully these tips will be as helpful to you as they are to me! 1. Make the cake up to two days in advance and freeze it. When you start decorating you want the cake to be frozen, so for time-saving purposes, it’s a good idea to bake the cake at least two days in advance. After baking, let the cakes cool completely on a cooling rack, wrap in plastic then freeze. 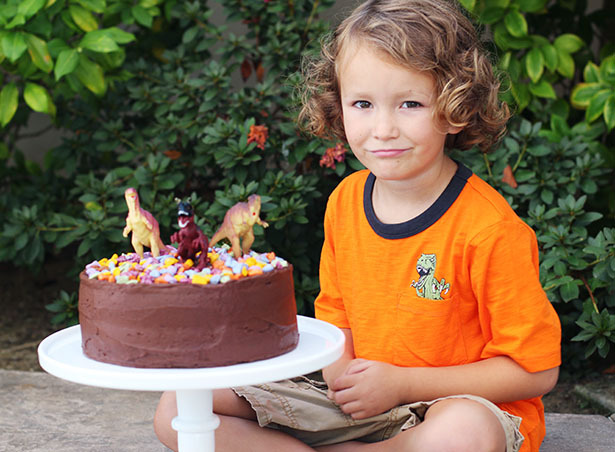 Have you tried the cake strip trick yet? I will forever be indebted to my friend Lindsay for sharing this trick with me. I get flat cakes out of the oven EVERY TIME. Click here for all the details. 3. Decorate the cake the day before you are going to serve the cake. The times that I’ve saved the cake decorating for the day of the party were always far more stressful times and the cakes were not as well done. I HIGHLY recommend decorating the cake the day before you need it! 4. Make a ton of frosting. The frosting recipe I will share below is enough to frost a 2-layer cake. When I know I’m going to be making a “cute” cake, I usually triple the recipe to be safe. 5. 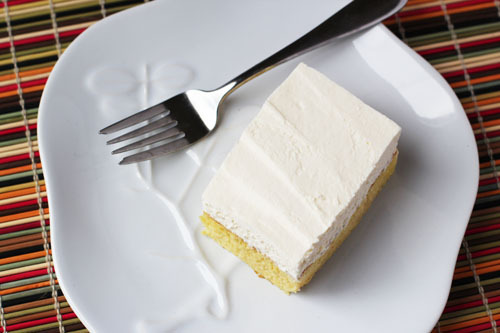 Spread a crumb coat on the frozen cake then refrigerate. When you’re ready to start icing the cake, do a crumb coat first. This is a thin layer of frosting that goes on before the final layer. If the cake is frozen it is much easier to ice. The crumb coat is an extra step but SO WORTH IT. It’s really wonderful to have a layer of frosting where it doesn’t matter if crumbs show…it makes all the difference. 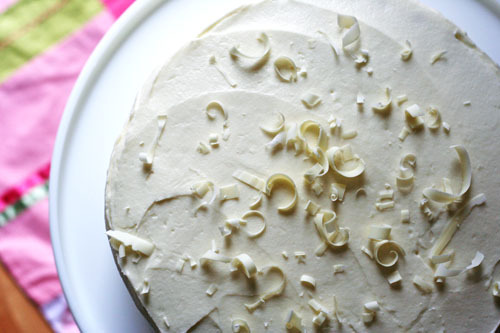 Once the crumb coat is on, refrigerate or freeze the cake again until the frosting firms up (30-60 minutes). Also, a quick note on carving. If you need to shape your cake, it’s helpful to carve it when it’s frozen. If it takes a while for you to get it all cut up, you may want to stick in the freezer again for 15-30 minutes before doing the crumb coat. 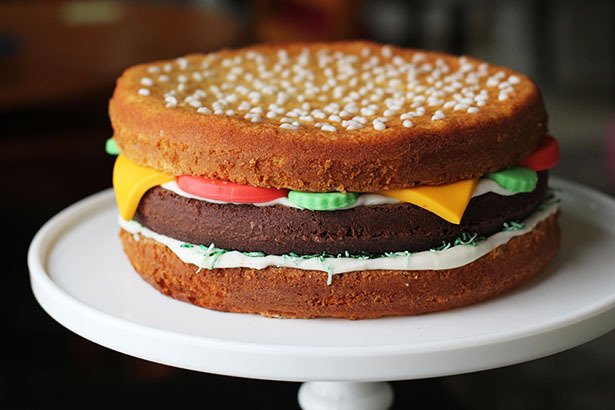 Bottom line – frozen cakes are easier to deal with the whole way through the process! 6. Don’t let the food coloring dictate the colors. I have a set of eight food color gels that I use, which provides me with lots of color options. However, I never use those colors straight up – I used to be a painter, I can’t resist mixing the colors! One of my favorite tricks is using brown to tone down the colors. I find most of the default food colors are a little bright for my taste. Adding a hint of brown makes nice, rich colors. 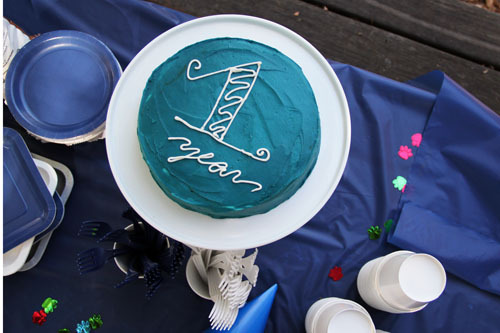 Click here for a chart from Wilton for more color-mixing inspiration. This color was made using blue, brown and black. 7. When you mix a color, make more than you think you need. I love making my own colors, but there is one problem…it’s tricky mixing the same exact color more than once. When you create a color, make sure you mix more than you think you need so you don’t run out halfway through the princess’s dress or Superman’s cape! 8. Seek out inspiration for designs! I have a book called “Cakes for Kids” by Matthew Mead that I LOVE. Either get your hands on that book or another similar title and use it for tips and inspiration. Searching the web is a great tool, too. I always do tons of looking around for shapes and ideas when coming up with the design. A simple design can be powerful and it’s much easier to execute, so the likelihood of success increases dramatically. And remember, cut the cake into the shapes you need when it’s frozen! 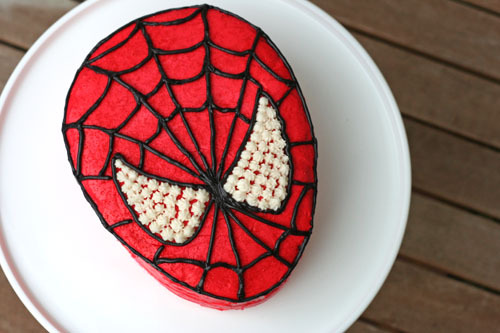 Spiderman ended up being super simple – I just had to shave off the edges of a round cake! 10. Draw the design ahead of time. Draw your design out on paper ahead of time, real-size. You can then lay that over the cake to cut it to the right shape and it’s not quite as scary when you put frosting to cake. 11. Buy a couple flat spatulas. I randomly picked up a couple straight spatulas at Michael’s once, not realizing how awesome they are. They have totally changed my ability to spread icing on cakes – it looks so much more smooth and pretty than when I use a butter knife. I have two angled straight spatulas – one little, one big. They are wonderful! 12. Buy a set of decorating tips and don’t be afraid to use them. 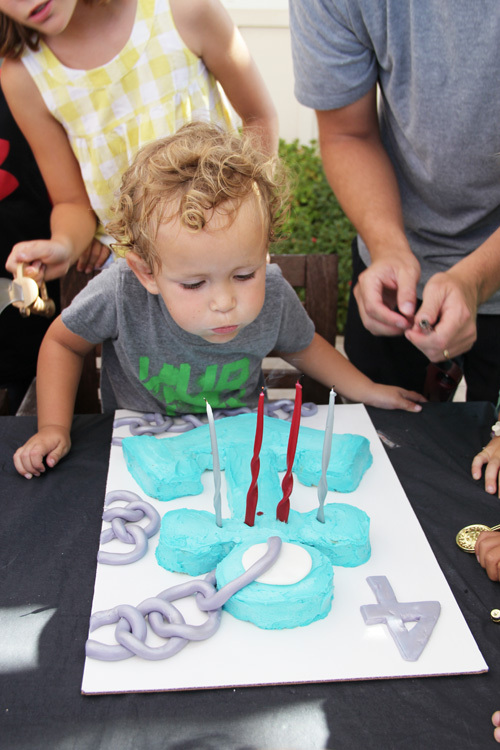 You need decorating tips in order to decorate the cake, so make sure you have a set! I recommend using gallon-sized freezer ziploc bags instead of piping bags – it’s just a lot easier for clean-up. Also, I generally spread a flat layer of buttercream over the whole cake and then either use the small round tip to draw on the cake or a flower tip to fill in areas, like Spiderman’s eyes and the doggie’s nose. 13. 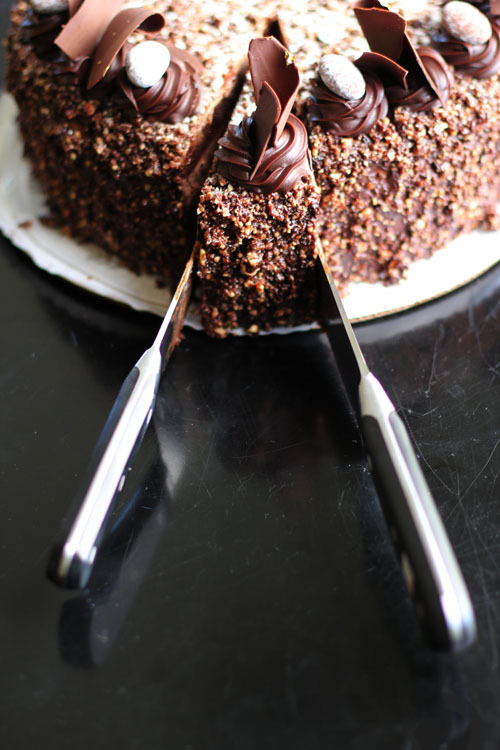 Use waxed paper under the edges of the cake to keep the plate clean. I wrote about this trick that my friend Nikki shared with me a few years ago and I still use it every time I frost a cake. Place your cake on the serving platter. 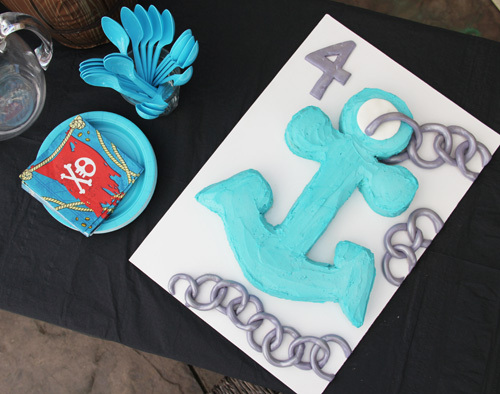 Tear up strips of waxed paper, about 2″ – 3″ in length, then tuck them under the edges of the cake all the way around. When the cake is completely iced, carefully remove the paper. I use a thin knife to sort of hold the icing back so it doesn’t stick to the wax paper and pull away from the cake when I remove the paper. 14. Cake boards are awesome! I love these cake boards for displaying the cake. They come in white, which looks cute, but you can always cover them with another color paper if you like (like pink for Hello Kitty). I bought a pack of big, round cake boards a few years ago and they’ve been wonderful to have handy! If you don’t have fun doing this, then don’t do it. I really love doing making these cakes, so it is worth the work. Make sure you’re having fun! I know it seems like Wilton sponsored this post, but they didn’t (although, I should have thought of that!). They just have great products that work! 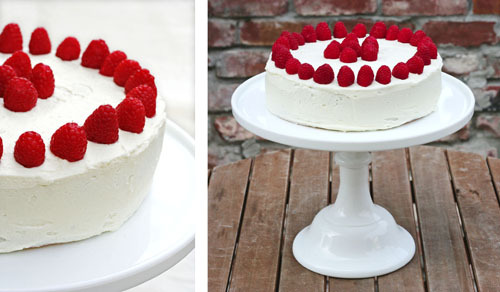 Wilton also has a page on their site “Cake and Dessert Decorating 101” that is very helpful if you want even more tips. For years I used cake mixes and I encourage you to do the same. They’re easy and taste good. However, I have started making my cakes from scratch just because I found some recipes that I love…and I guess I like to make things harder on myself than I need to. 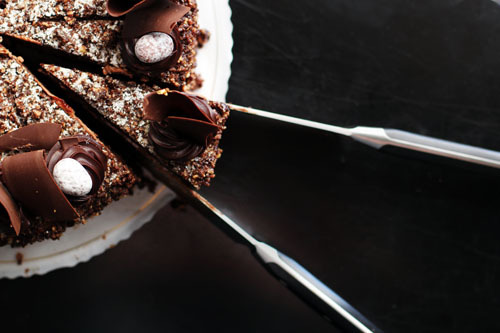 The chocolate cake recipe below is seriously AWESOME. Just sayin’. I love homemade buttercream and use it for almost all of my cakes (recipe below). I hate store-bought frosting. Making buttercream is in fact super easy so you should just bite the bullet and do it! The recipe below is perfect – my frosting comes out right every time. 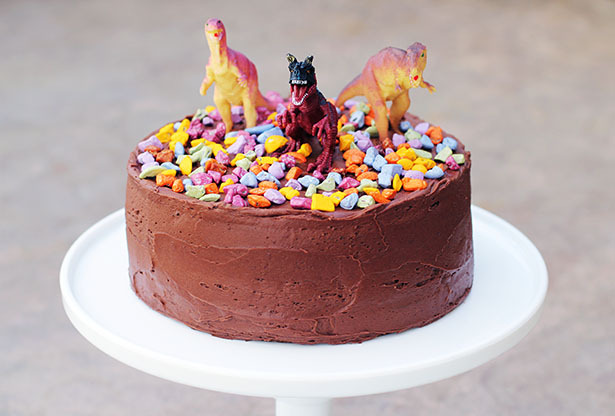 I have used swiss meringue buttercream at times – it tastes fabulous and you can play around with how the surface of the frosting looks a bit more (for example, on the elephant cake I could create texture that I would not be able to do with regular buttercream). It’s a bit more work to make, so if I don’t need the flexibility of texture, I just stick with regular buttercream. I’ve also used 7-minute frosting because I needed to (you have to check out Anna’s ghost birthday cake…so funny), but I HATE HOW IT TASTES, so I will only ever use it again if I have need to pipe little ghosts. 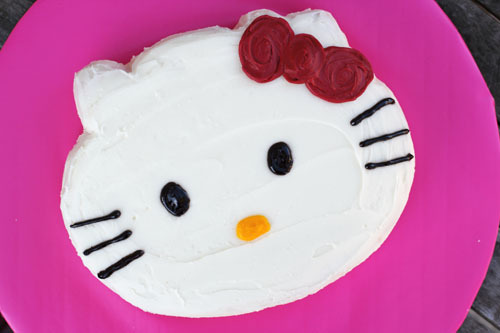 Feel free to chime in with your own cake decorating tips and tricks! Lightly grease two 8-inch rounds OR two 9-inch rounds OR one 10-inch round. Line bottom of pan with waxed paper or parchment paper, grease again, then coat pan with thin layer of flour. If doing cupcakes, line 24 cups with liners. In a medium bowl, whisk together flour, cocoa, baking soda, baking powder and salt. Using an electric mixer, on medium to high speed beat the butter in a large bowl for 30 seconds. Gradually add sugar ¼ cup at a time at medium speed and then beat 3-4 minutes more or until well combined. Scraped down sides of bowl. Beat 2 minutes more at medium. Add eggs 1 at a time, beating for 30 seconds after each addition. Beat in vanilla extract. With the mixer on low, add flour in 3 additions, alternating with milk in 2 additions, beating until just combined after each addition. Beat on medium-high speed for 20 seconds more. Spread batter in prepared pans - fill pans ⅔ full. Bake 30-35 minutes or until toothpick comes out clean (make sure you don't undercook! You want no jiggling in the middle and a clean toothpick). Place cake on wire rack and cool for 10 minutes. Invert onto the rack, lift of the pan, remove waxed paper and let cool completely on rack. Cupcakes should cool in pan for 15 minutes before removing. Author: Adapted from "How to Cook Everything"
Beat butter with a mixer (I use my KitchenAid with the paddle attachment). Gradually work in the sugar, alternating with the cream and beating well after each addition. If the frosting is too thick to spread, add a little more cream, a teaspoon at a time. If it is too thin (which is unlikely), refrigerate for a few minutes; it will thicken as butter hardens. You can add up to 2 teaspoons of vanilla, but if you need white frosting leave the vanilla out! 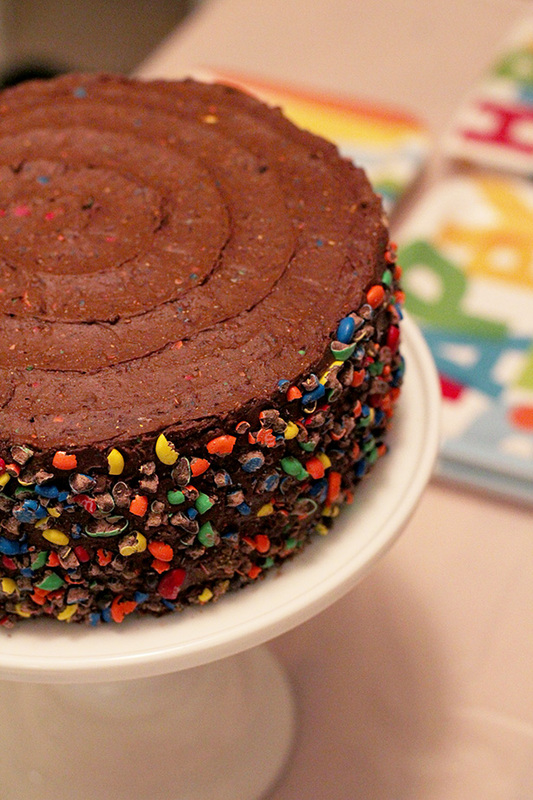 This giveaway is now closed, but you really should keep reading because this cake is DELISH. It’s no secret I love Ree Drummond, The Pioneer Woman. I am very grateful to know her. She is lovely. And she deserves every bit of success she is having. I like it when good karma just works like that. Plus, her food is yummy. I am delighted to share Ree’s latest cookbook with you! The Pioneer Woman Cooks: Food From My Frontier just came out and it is every bit as scrumptious as her last cookbook and her delicious website. This book is also brimming with cream. LOTS of cream, people. Like, you might need to buy a cow or at least some stock in your local dairy. I needed a dessert the other night because, well, I just needed one, okay? I flipped open Ree’s book and discovered Tres Leches Cake, which I am tempted to rename Patience Cake. Seriously, you need some patience for this recipe. There is a lot of waiting. But it is worth the wait. Believe me. 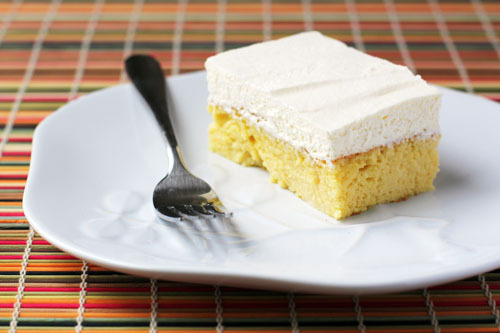 Tres Leches Cake is my daughter Anna’s dream dessert. She’s not big on dessert or chocolate. (I am still wondering if she’s really my child.) But she loves milk. And she loves whipped cream even more than milk. She ate THE ENTIRE PIECE OF CAKE. I don’t think she’s ever eaten all of her dessert. Before we get to the recipe, how about a giveaway? I love giving away great cookbooks! THREE of you lucky, randomly-selected people will each win a copy of Ree’s new book The Pioneer Woman Cooks: Food From My Frontier. Simply leave a comment on this post by Midnight PT on Monday, March 26. The winners will be announced on Tuesday, March 27. Good luck! 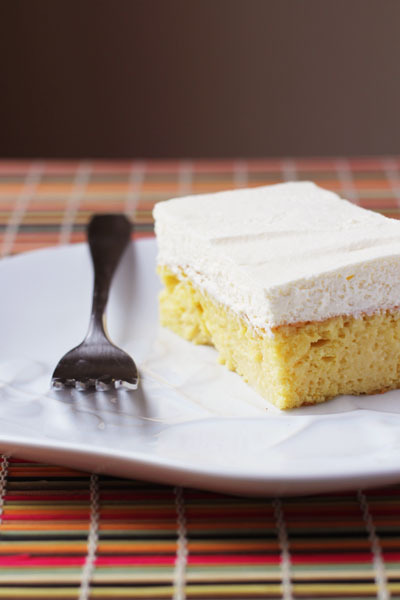 And, to help quench any whipped cream and/or milk and/or cake cravings you may be having, here is the Tres Leches Cake recipe, with my notes. Enjoy! Preheat oven to 350 degrees F. Grease and flour a 9”³ x 13”³ pan. Combine flour, baking powder and salt in a large bowl and set aside. Mix egg yolks and ¾ cup of sugar in a mixing bowl. Beat until very light in color (Jane note: I used my hand mixer, you can also use a stand mixer). Add milk and vanilla and beat until just combined. Pour this over the flour mixture and stir gently to combine. In a separate mixing bowl beat the egg whites on high speed until soft peaks form. Add ¼ cup of sugar and continue beating until the whites are stiff but not dry. Gently fold the egg whites into the other ingredients. Don’t over mix, stop stirring just before everything is mixed together. Whip 1 pint of cream with 3 tablespoons sugar (Jane note: I use powdered sugar here because that’s what I like in whipped cream) until thick. Spread over top and sides of cake (Jane note: or just the top if you left the cake in the pan). Jane note: Here’s the last bit of waiting”¦the cake was good at this point, but it was REALLY good the next day after being refrigerated. I highly recommend eating after it is cold! Totally worth all the waiting and your patience skills will be well-honed! Regardless of when you eat the cake, leftovers need to be refrigerated. 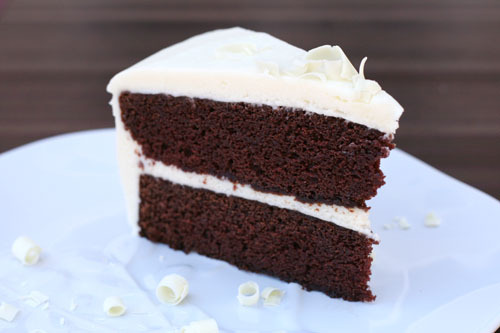 As good as the cake I shared with you yesterday was (and it was mighty good), I simply could not resist pairing that heavenly white chocolate cream cheese frosting with some real chocolate. And since two cakes are certainly better than one, only a week after I made the raspberry cake I went ahead and threw this puppy together. I used the recipe that my friend Lindsay uses for her chocolate ganache cake and it worked beautifully. The frosting tasted just as good on this chocolate cake as it did on the raspberry cake. The subtle flavor of raspberry in the frosting complemented the richness of this classic chocolate cake very nicely. I can’t decide which cake I liked better. Nate voted for the raspberry cake, although he had to really think about it. The jury’s still out for me. What I do know is I need to stop making cakes pronto. This is downright reckless behavior! Whisk together water, cocoa, and espresso powder until smooth, then whisk in milk and vanilla. Divide batter among pans (about 2⅓ cups per pan for 3 pans), smoothing tops. Bake in middle of oven until a tester comes out clean, 30 to 35 minutes for 7-inch pans or 20 to 25 minutes for 8-inch. Cool in pans on a rack 30 minutes, then invert onto racks, remove paper, and cool completely. Beat cream cheese and buter in large bowl with electric mixer on medium (I used my KitchenAid) until well blended. Add cooled white chocolate and raspberry extract. Mix well. Gradually beat in confectioners’ sugar until light and fluffy (I let the KitchenAid go for several minutes and the frosting truly got light and fluffy). A few months ago, my friend Rachel’s babysitter, Maria, made a cake for Rachel’s birthday. I couldn’t stay for the whole party, so Rachel sent me home with a generous amount of cake (that’s a good friend, eh?). The cake was white, the frosting was white…I knew it would be good, but I wasn’t that excited since there was no chocolate involved. Then we ate the cake. Oh. My. Goodness. 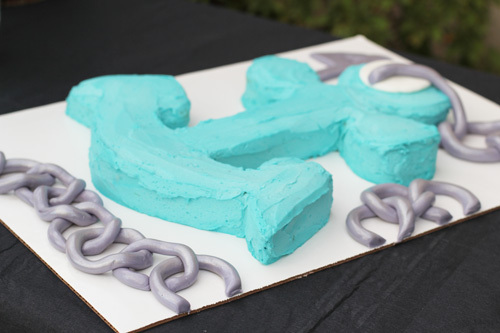 It was wonderful, and the frosting was amazing…and completely mysterious. We couldn’t quite figure out what it was made of. As soon as we finished our cake, I emailed Rachel asking her to beg Maria for the recipe. P.S. – I will have a follow-up cake recipe tomorrow. You won’t want to miss that one either. Preheat oven to 350 degrees. Grease and flour two 8- or 9-inch round baking pans. Melt white chocolate with about half of the milk in a small, heavy saucepan over very low heat, stirring constantly until chocolate starts to melt. Remove from heat; stir until smooth. Stir in remaining milk. Let cool. Combine flour, baking powder and salt in a small bowl; set aside. In large mixing bowl, beat butter with electric mixer until soft and smooth. Add sugar and raspberry extract; beat well. Add eggs, one at a time, beating after each addition until well-combined. Alternately add flour mixture and white chocolate mixture, beating on low speed after each addition just until combined. Jane Note: Several people have commented that their cake did not rise when using this recipe. This recipe has worked for me and for the woman who gave me the recipe, as well as for other commenters. Cakes are sensitive in terms of the mixing process and, when not mixed properly, can collapse when cooking. Butter and sugar should be well mixed, eggs semi-mixed, and flour barely mixed at all. I would recommend the following technique when mixing in the ingredients in the above paragraph. Beat the butter for 30 seconds alone on medium-high speed. Add sugar, ¼ cup at a time, beating for 3 minutes between each addition, at medium-high speed. Add eggs one at a time, beating at medium speed for 30 seconds after each egg. When adding the flour and chocolate mixtures (alternating as directed), beat on low speed and mix until just combined. Beat for 10-20 seconds at medium-high speed at the end for one final mix. Following this technique should increase the chances that your cake will NOT collapse in the oven. Spread batter in pans. Bake for 20 to 25 minutes or until cake tests done. Let cool in pans on wire racks for 10 minutes, then remove from pans and let cool completely. Stir food color into ⅔ cup of the frosting until well blended (I actually didn't do this part...I just kept all the icing white, mostly because I didn't read the recipe carefully 😉 ). Place 1 cake layer on serving plate. Spread with the tinted frosting. Top with remaining cake layer. Frost top and side of cake with remaining frosting. Top with raspberries just before serving. Store cake in the refrigerator. Beat cream cheese and buter in large bowl with electric mixer on medium (I used my KitchenAid) until well blended. Add cooled white chocolate and raspberry extract. Mix well. Gradually beat in confectioners' sugar until light and fluffy (I let the KitchenAid go for several minutes and the frosting truly got light and fluffy).